Traditionally, the 12 days of Christmas celebrate the Christian nativity, beginning on Christmas Day and lasting until January 5. However, many people have time off in the days leading up to Christmas and then must return to work shortly after January 1. Whenever you celebrate your 12 days, planning daily activities during this time makes the holidays more enjoyable, especially if you have children. Whether you’re in your home or out and about, here are 12 Christmas activity ideas for you to try this year. It might not sound like fun, but you can make it fun when you’re creative! By getting this taken care of first, everything else will be easier for the New Year. Put on festive holiday tunes and try to make a game out of cleaning the house. Whether you make homemade ornaments out of paper, or you string popcorn and cranberries to make a garland, making decorations is a fun project for the whole family. Now that you have made decorations, it’s time to hang them and keep your home filled with holiday cheer. For indoor or outdoor lighting, keep in mind these Holiday Lighting Safety Tips. Watching the classic movies of the season is a great way to stay in the holiday spirit. Make your favorite treats, and turn the lights down for Christmas or New Year’s Eve movie fun. Making Gingerbread houses are a favorite among Christmas activities for children. You’ll need gingerbread dough or graham crackers, gumdrops, stick pretzels, sprinkles, icing, small marshmallows, assorted small candies, and your imagination. Invite loved ones for a casual potluck gathering. This is a great opportunity to catch up with friends you might see only rarely. Make a list of things people can volunteer to bring, and coordinate it so that everyone is bringing something different. For more formal gatherings, here are 5 Simple Ideas for Hosting a Holiday Party. One of the best ways to get in touch with the heart of the season is to help the needy. Look for charities that need help and volunteer your time or donate gifts. You won’t want to miss this opportunity for capturing images of loved ones. If you have a great camera, skip the professional portraits and create your own photo shoot with holiday decorations in the background. Many nursing home residents have no family members visiting them during the holidays. Brighten their day by bringing cards and small gifts. Speak with staff beforehand to see if there are special conditions to consider, such as food allergies, if you plan to bring edible treats. Take a trip around your town to see the holiday decorations and lights. Plan stops along the way to enjoy cocoa, hot coffee, or a small snack. The holidays offer a good excuse to treat yourself a little. 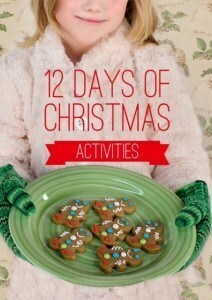 Make cookies, chocolate covered pretzels, popcorn balls, pies, or gingerbread. Photos are great in their own right, but videos can be extra fun to make and to watch later. Capture the fun of this year’s holiday season on video. You could ask everyone to say one thing they love most about the holidays. Switch the Christmas activities around to meet your family’s schedule and personality. There are no rules for enjoying Christmas activities except to simply enjoy them! Some things will become family traditions, and others might be left aside for next year or when children get older. No matter which activities you choose, you’ll be sure to create lasting memories. Click here for more ways to enjoy the holiday season in your home.